Yes, we can just plain old REBOOT a computer with a 5 minute timer. Five minutes is more than enough time to save a file, then walk away and get a cup of coffee, take a bio-break, whatever -- right? There's a problem with that in that the end-user isn't a computer. They're a person, and "wet-ware" doesn't always do the most logical thing, they do what they need to do or want to do at the time that they need or want to do it. So why not give them an option? Let them put a pause on the reboot and ask again later - wouldn't that be the nice thing to do? I say keep asking until they don't notice mind the computer rebooting - so how about this? If they don't answer the prompt within the timeout period (as written 3 minutes) then we'll assume they aren't actually sitting at the computer and won't mind if the computer reboots. So it reboots immediately. 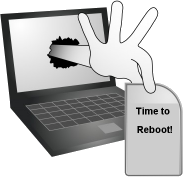 Of course, if no users are logged into the computer at the time the procedure runs, the computer immediately reboots just as a matter of course.